Crush the oreos in the food processor or by bashing them in a zip lock bag with the rolling pin. Whip the cream. Make sure its super chilled before you whip it. Cut the swiss roll in 1 inch thick slices. 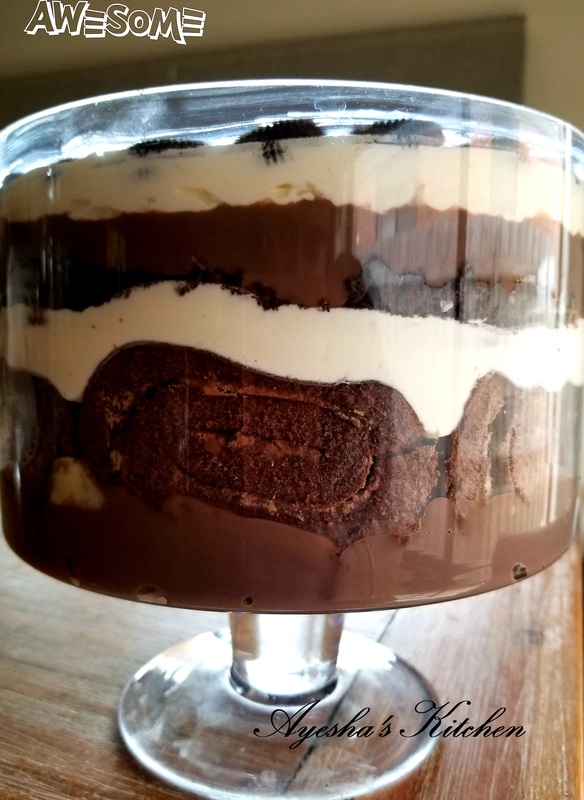 In a deep clear serving bowl (trifle bowl), lay a thick layer of chocolate custard, then swiss roll slices, vanilla custard, half of the whipped cream, crushed oreos, rest of the cake and rest of the chocolate custard. Let it set for 5 minutes and then lay a final layer of whipped cream and decorate with some mini oreos. Let it cool and set for 6 hours or more in the fridge and serve. For custard I use Rafhan (Pakistani brand) custard powder in mango flavor. Boil 1 cup less 1.5 litre milk in a non-stick pan. Dissolve custard powder in that reserved one cup of milk and gradually add it to the boiling milk with gentle constant stirring followed by sugar. Cook on low heat until it is thick and sugar is dissolved. Keep aside to bring it to room temperature. Meanwhile cut the fruit, whip the cream and set the jello. In your trifle bowl put two big spoonsful of custard and then one sheet of unfilled sponge. Now damp the sponge with mango nectar using a pastry brush. Then a layer of custard, cut up mangoes, diced jello, whipped cream and then another layer of unfilled sponge. Damp that layer of sponge with mango nectar as well and then a final layer of custard. Refrigerate for 2 hours until everything is set. 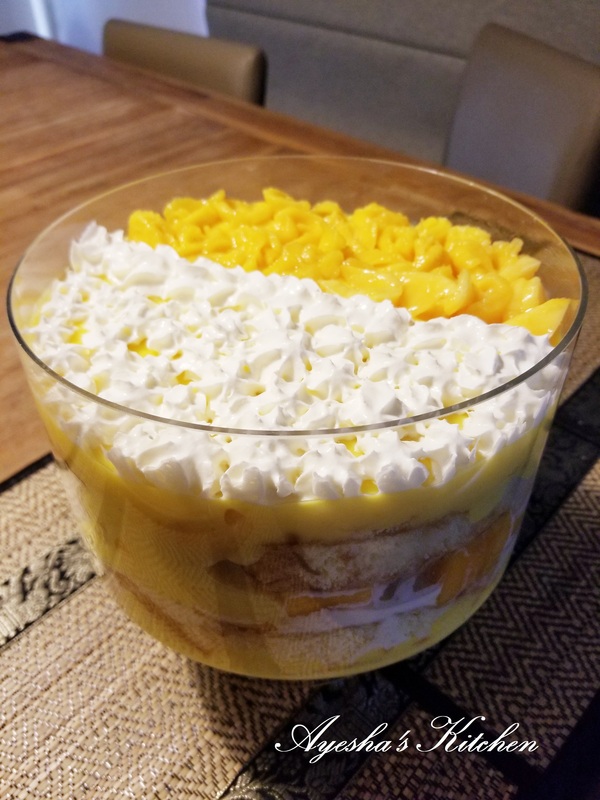 Now whip some cream to stiff peaks and cut some mango to decorate the top pf trifle. Decorate as you like and chill for another hour if you have to otherwise serve. Mango mousse is one of my favorite summer desserts. King of summer fruits, chilled cream and sweetness of condensed milk….. it is like summer in a cup. Follow this easy recipe and make your next BBQ party great! Put hand mixer attachments and a mixing bowl in freezer for 30 mins before whipping the cream. In a blender combine mango pulp, condensed milk and gelatin and make puree. Now whip the cream to stiff peaks and gently fold in the mango pulp until everything is uniform. Put it in your desired serving bowls and chill for 6 hours. 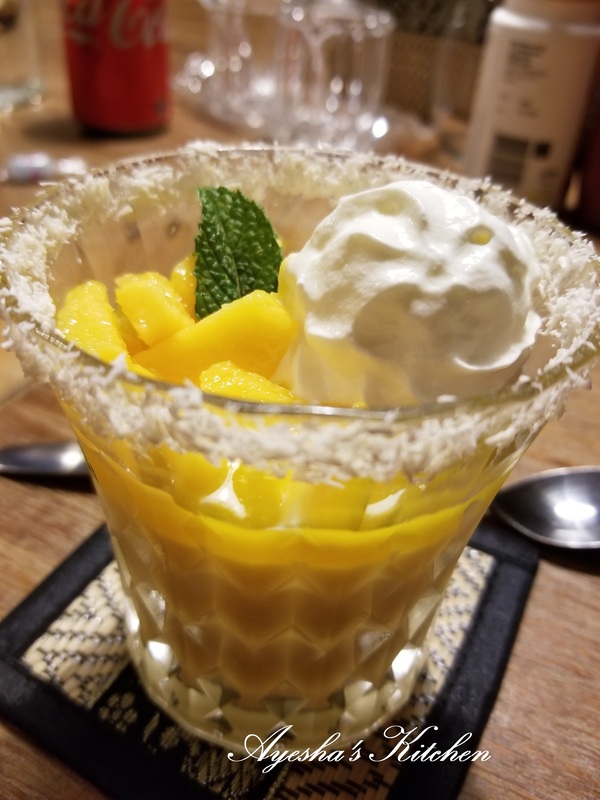 Mango delight is my Mom’s sweet dish. In Pakistan, we have the best mangoes of the world and they are cheaper and in abundance. And she used to make this dish in Summers as party dessert. 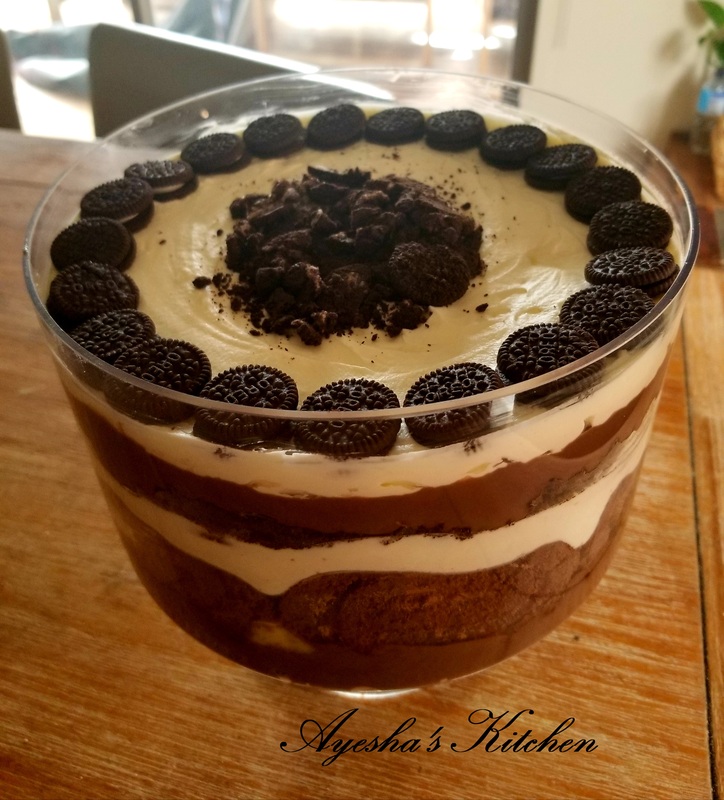 It is very easy, tasty, natural and hassle free dessert and everyone on the table loves it. Cut and prepare everything. For Jello, add extra unflavoured gelatine while making the jelly to make it more stiff and less wobbly. 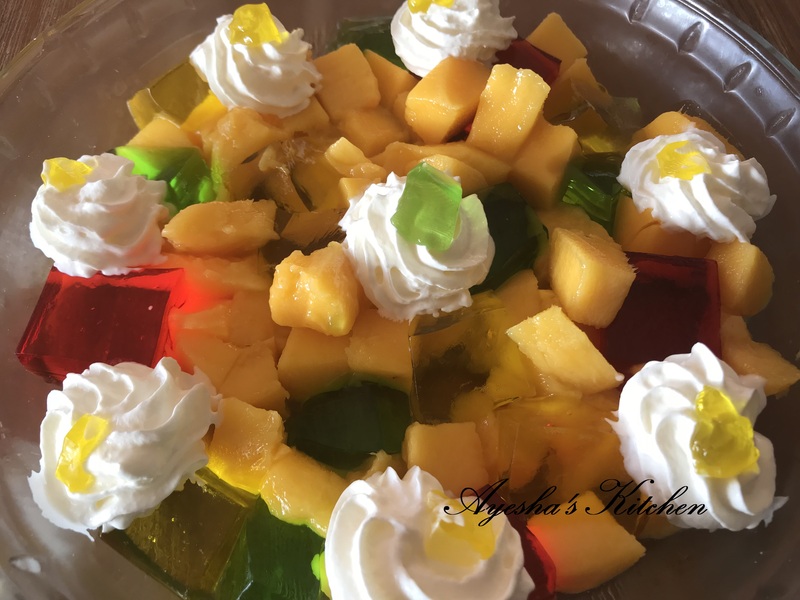 In your serving dish, Put all the chunks of mangoes and jellos and whip the cream. 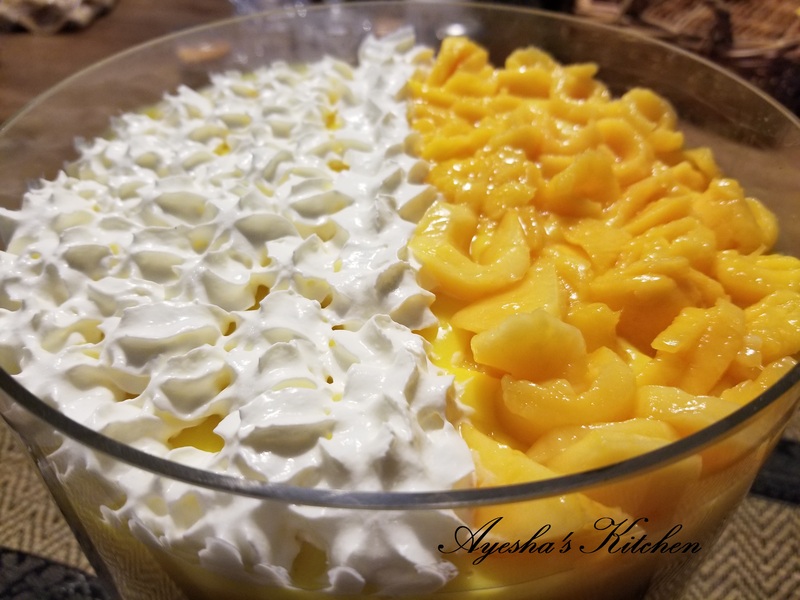 For whipping the cream, put your whipping bowl and whisks in freezer for 30 minutes before whipping the cream to make it stiff and easy to handle. Decorate the top of the dish and refrigerate until needed but don’t refrigerate for more than 2 hours. 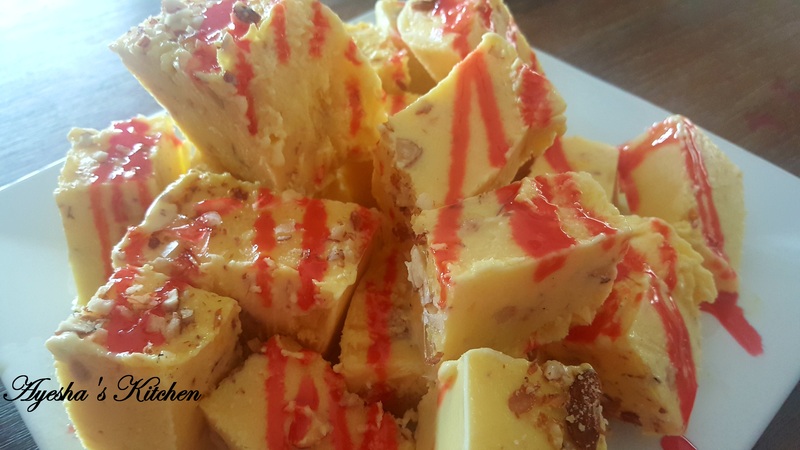 Say Hello to Summer with this beautiful recipe…. perfect for your get togethers, BBQs or birthdays. In a food processor crush graham crackers & macadamias to crumbs and add sugar and desiccated coconut and mix. Add melted butter and mix more until it looks like wet sand. Spray the bottom of springform pan and press this mixture in the springform pan to make the crust of the cheesecake. Refrigerate until needed. For mango puree put all the ingredients given above in the blender and mix well until its smooth. In a deep mixing bowl, use the electric hand mixer to whip the cream cheese. When it is soft add cream and whip well. Now add mango puree and mix again and at the end mix in gelatine mixture as well. We put gelatine at the end so it mixes into the mixture uniformly. Pour this mixture into the prepared base and refrigerate overnight or for 24 hours for good results. When its set, run a knife thru the edges and take it out onto your serving plate. 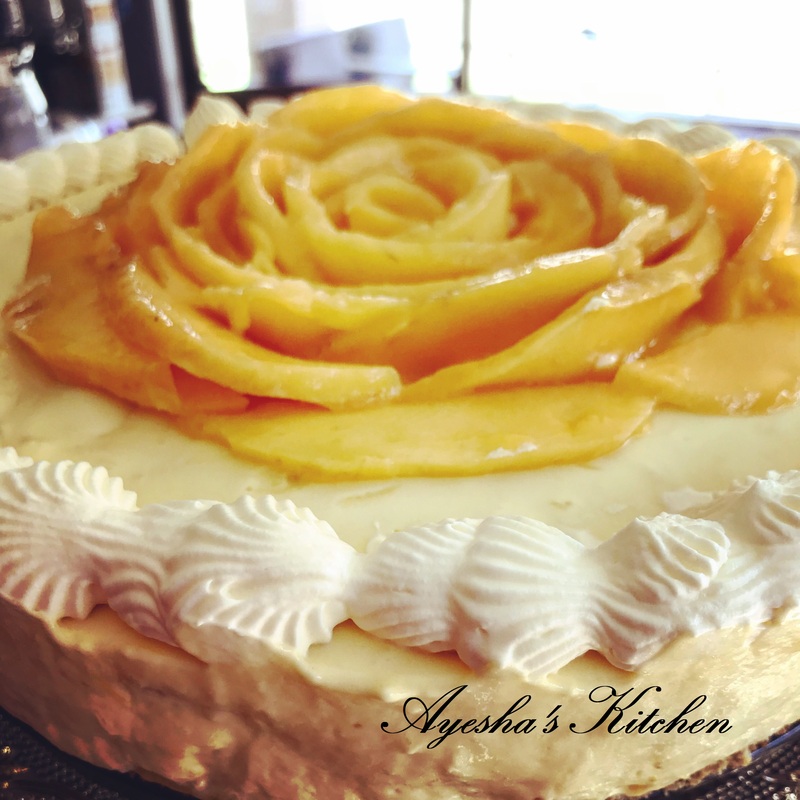 Decorate with some mango slices or chunks and some whipped cream. Serve. Take ¼ cup of milk out of 0.5 ltr milk and boil the rest of it. Now add condensed milk and stir well. Add pistachios, almonds and kewra. Now in ¼ cup of milk mix rice flour and mango custard powder and add this to the cooking mixture and stir well. Add cream and turn off the flame. Allow it to cool for 1 hour and mix in chopped mango. Pour it in a mold and freeze for 12 to 16 hours. Take it out 15 minutes prior to serving and cut blocks with hot knife. Serve with a drizzle of jam e Shireen or rooh afza if you want otherwise some slivered nuts will do.